You're a head football coach. You have a beef with a member of the fourth estate. And boy howdy are you pissed. Listen, it's not just that somebody wrote a column you didn't like. It's not even that somebody questioned your manhood in print. That's just sticks-and-stones stuff. For the smart coach, that's no big whoop. ON DEC. 1, 2007, though, Kirk Herbstreit of ESPN erroneously reported that LSU's Les Miles was about to jump ship to his alma mater, Michigan. In hours, Miles and his Tigers were going to play Tennessee for the SEC championship and a slot in the national-championship game. A source has told ESPN's Kirk Herbstreit that barring any unforeseen circumstances, Michigan will announce early next week it has reached an agreement with LSU coach Les Miles to be its next head football coach. Herbstreit is also reporting that Miles will make Georgia Tech defensive coordinator and interim head coach Jon Tenuta part of his staff at Michigan. Miles, who played at Michigan and served two stints as an assistant under the late Bo Schembechler, will succeed Lloyd Carr, who stepped down after the Wolverines' loss to Ohio State last month. Miles has been head coach at LSU since 2005. LSU is 32-6 with Miles at the helm, including 22 wins in his first 26 games as coach, and won 11 games in 2005 and 2006. The No. 7 Tigers (10-2), whose two losses this season both came in triple overtime, will play Tennessee in the SEC Championship Game on Saturday. Miles also coached at Oklahoma State, posting a 28-21 record between 2001 and 2004, and was tight ends coach for the Dallas Cowboys between 1998 and 2000. Miles has a 60-27 overall record in seven seasons as a head coach. A STORY like that, on a day like that, just might blow up everything. One can imagine exactly how furious Miles must have been. The man also had to be the next best thing to panic-stricken. And it was absolutely imperative that he talk to the press right then. The coach barely had the luxury of counting to 10 before opening his mouth. Look at the video. If you're totally pissed off, but go before the assembled sports press you must . . . that is how you do it. THE THING about Nebraska Coach Bo Pelini's petulant performance Saturday night after beating Ohio State was that his moment of crisis had passed. He had won the game. He ought to have been ecstatic. Instead, he chose a very public venue to take very public shots at an Omaha World-Herald columnist who had the gall to have an opinion Pelini didn't like. About a column that, in light of Nebraska's win and its quarterback's second-half play, had just become a moot point. 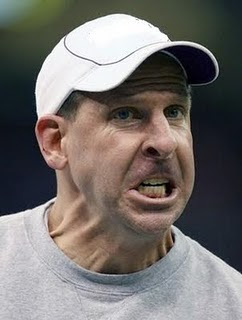 IN 2007, Bo Pelini was Les Miles' defensive coordinator. The man learned nothing. I wonder how long he'd keep around a player that willfully dense. Then of course, we had this week in good ol' South Cack, a meltdown by the Ol' Ball Coach --- presumably over an article from six months ago, by a print journalist from the local fishwrapper ....... never mind that we just let go our QB, dammit, I want THAT GUY out of the press conference!